July 26, 2015 Is Your Shoulder or Back Pain Really Just a Pain in the Neck? As you’ve probably read by now, June and July have been my month for shoulder and back pain. Not one to let a little (sic) pain get me down, I have taken all of the usual routes (medical, chiropractic, massage, acupuncture, homeopathic, topical and exercise) to send the pain on its way. As can be expected, some methods have been more effective than others. For example, the muscle relaxers helped start the healing process, but the prescription pain killers just gave me a headache. The acupuncture was pretty uncomfortable and I saw no noticeable results. True to form, the winning combination was homeopathics, Salonpas Deep Relieving Gel, a couple of trips to my chiropractor, massage (my personal favorite) and exercise. I’ve combined several things into the last one and have done my share of research to find things which work best. In my chiropractor’s words, “the motion is the lotion”, so I looked for ways to lubricate my shoulders from within, aside from the glucosamine, fish oil and turmeric I was already taking. One of those was a series of exercises designed to move the shoulders (and mine, by the way, make a delightful snap, crackle, pop with every move!). These seem to be most effective first thing in the morning when everything has tightened up after laying around for several hours. As the day progresses, I add shoulder lifts and bicep curls with 5-pound weights. (this is a very light weight for me, but some may want to use only 1- or 2-pound weights.) Sometimes, I can do 3 or 4 of the 5 different exercises one right after the other, but more often, I do 3 then do the other 2 later. Though difficult to do when at the point where all you want is drugs to stop the pain and ease the tension, as the body seeks its own equilibrium, you begin to notice things like Hmmm, when I turn my head like this I get a sharp pain in my shoulder. or When I turn my head like this, my right arm goes numb. At this point, the chiropractor’s comments about your neck start to make perfect sense. You experiment by moving your head from side to side, then lean back and forward. Not only will you determine where your range of motion is impaired, but you’ll make a note of the sensations each movement causes. The light bulb comes on, bright and clear and you realize that the source of the pain is somewhat removed from the location of the symptoms. Now that I’d figured out where the real source of my pain lived, I was ready for miracle number 2. A few days ag o, I was stuck on the phone for about 3 hours and my ADHD was running amok. Although I’d done a massive purge a few months ago, relegating about 6 boxes of old paper to the shredder, I started digging through the closet in my office on the off-chance that I’d had the forethought to save paperwork from a company I worked for 20 years ago. Although I didn’t find what I was looking for (and how often does that happen!) I did find something I’d sought a couple of weeks ago and had even given up hope was still in the house. In case you haven’t guessed by now, I found my Miracle Balls! Since I’d already determined the source of my problem, I skipped right to the section on neck exercises. As suggested, I started off slowly, but have now been through all 4 exercises a couple of times. In fact, doing the exercises before I went to bed last night relaxed the muscles enough to make sleeping in my bed a lot more comfortable than it has been for the last month or so. Repeating the neck exercises this morning in conjunction with my shoulder exercise routine has everything moving more freely. I did make an attempt to use the ball under one shoulder, but found that it is as painful, if not more so, than using the foam roller as the ball allows for a more intense amount of pressure on the affected area, given its smaller size. Wimp that I am, I could barely stand 30 seconds. The accompanying book is very helpful in showing how things are connected so you can set your own order to the exercises. For me, I find that Elbow on the Ball follows Head and Neck on the Ball for the relief of shoulder pain and stiffness. Though not necessarily intuitive, the author’s explanations about how everything connects and how relaxing one area impacts another are a good guide for determining the order of your own exercise routine. 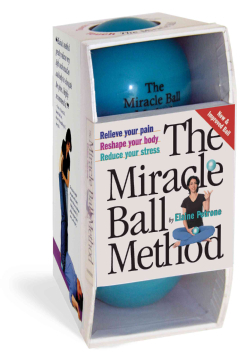 For now, only two days with the addition of the Miracle Balls has brought a great deal of relief and what’s more, increased flexibility to my neck. I hope to bring more good news and handy hints as I continue this new journey. To be honest, I’m willing to try just about anything that allows me to meet the four chapter target I have for this week! 1. I am grateful for fortuitous finds. 2. I am grateful for my ADHD whose benefits far outweigh the challenges it has brought into my life. 3. I am grateful for gentle things which ease my pain and improve my range of motion. 4. I am grateful for another amazing night of dancing which sent my endorphins into overdrive. 5. I am grateful for abundance: flexibility, good sleep, epiphanies, health, joy, friendship, laughter, love, beauty, kitty love (especially when I lie on the floor to exercise), peace, harmony, prosperity and philanthropy.